Anaerobic Zone is pleased to announce theintroduction of the first complete Bicycle Protection System (Patent Pending) for bikesmounted on indoor trainers. It protects the bike's components (stem, headset, handlebar, fork, brakes, front derailluer, front wheel assembly, computers and the frame's finish) against costly corrosion caused by perspiration. The trainer cover protects the floor covering and trainer stand as well. Utilizing Velcro© attachments, the Bicycle Protection System is easily installed or removed in a matter of seconds and adjusts to multiple frame sizes from 48cm to 62cm. It is compatible with both road and aero bars. A large, clear viewing window allows visibility and access to any computer controls. 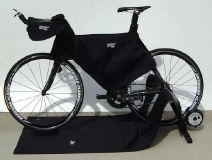 Extremely durable and functional construction, the 600 denier, nylon top layer of the material absorbs moisture while the underside layer of waterproof vinyl prevents any leakage on to the bike, components or floor covering. The Bicycle Protection System is easily maintained by hosing it off and hang to dry. It is covered by a three year limited warranty. The Bicycle Protection System eliminates the need to wipe down the bike after a hard trainer workout and the costly replacement or maintenance of components or floor coverings corroded or damaged by perspiration.